If you are reading this article, it is likely that either you or someone close to you is cross dominant. While this may seem like a big problem, don’t worry, cross dominant shooting is just a temporary inconvenience that can be easily overcome. 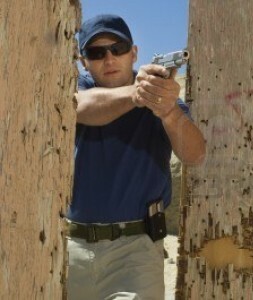 If the cross dominant person is new to shooting, the easiest way for them to overcome cross dominance is to have them learn to shoot with their dominant side. So, if they are left eye dominant they shoot left handed, and if they are right eye dominant they should shoot right handed. It may feel weird at first, but new shooters can pick this up much more easily than someone who has already developed shooting habits. This will be the best bet in the long run for the new shooter. If you’re not a new shooter, then you’ve got a decision to make. Before I give any suggestions, here is how I dealt with my own cross dominant shooting. Being primarily left handed, I grew up learning to shoot left handed and thus aiming with my left eye. When I was in my mid 20’s, I learned that I was right eye dominant. I never really remembered having a problem aiming as a kid, but when I learned I was right eye dominant and tried to aim with my right eye, I was pretty amazed at how much more clearly I could see my sights and target with my right eye. But, I had grown up shooting left handed and aiming with my left eye, and over time my eyes had adapted so that aiming with my left (nondominant) eye had become a natural reflex. In the end, I decided to keep shooting left handed / left eyed, mainly because I could already shoot well this way and I had done it this way for so long that it just felt natural. Now, if you’ve already been shooting cross dominant but you’re determined to make the switch, I have some good news and some bad news. The good news is that you don’t actually have to make much of a change in regard to pistol shooting. To switch eyes when shooting a handgun, all you need to do is tilt your head slightly so that your dominant eye lines up with the sights. Not really a big deal. Now the bad news. Making the switch with long guns will not be that easy. You are going to have to re-train your muscles and eyes to hold a rifle or shotgun to the opposite shoulder that you’re used to. One thing I’ve noticed is that operating a pump shotgun on your weak side can be especially difficult to master. This will likely take a while for the switch to feel natural, but if you think making the switch is your best bet than by all means go for it. It is definitely doable. One tip to help you learn to shoot with your other eye is to put a piece of scotch tape on your glasses over the focal point of your non dominant eye. This will prevent your non dominant eye from focusing and will help you train your dominant eye. They do make special shooting glasses for this, but a budget solution is the scotch tape method which works just as well. Now that I’m into competitive pistol shooting, I’ve recently decided that I want to start teaching myself to shoot with my weak hand (right), basically just for the heck of it. Plus, it would be nice to know that I could shoot effectively with either hand should I ever find myself in a crazy SHTF scenario. I haven’t done any actual weak hand shooting yet, just dry firing in the house, but the cool thing is that since I’m already right eye dominant I am finding target acquisition to be pretty easy when shooting with my right hand / right eye. I’m really looking forward to the day when I can shoot a match left handed and then turn around and shoot another match right handed and compare the two.